1 (15.25 ounce) can of whole kernel corn with liquid. 1 (14.75 ounce) can of cream style corn. 1 cup of small uncooked seashell pasta. ½ cup of cut into pieces butter. 1 cup of cubed processed cheese. 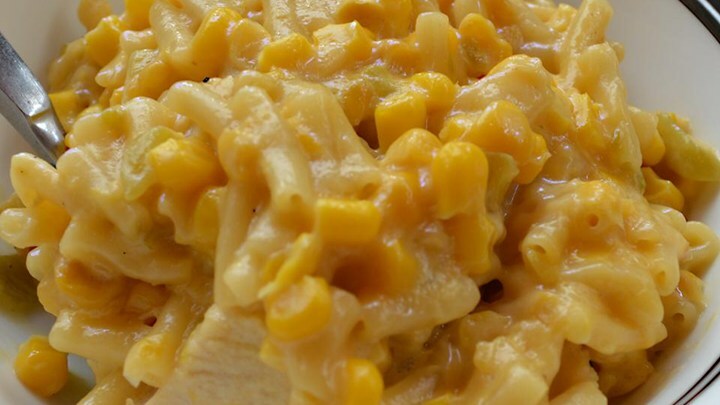 In a medium baking dish, mix together the whole kernel corn, cream style corn, uncooked pasta, butter and processed cheese. Bake covered in a preheated oven to 350 degrees for 30 minutes. Take off the cover, stir and bake for another 30 minutes. Easy, peasy and cheesy! This corn casserole is very delicious. I usually make this for dinner but feel free to make it whenever you want!